Though the American Civil War was one of the greatest conflicts in the history of Irish people, the vast majority of Irishmen chose not to fight in Union blue or Confederate gray. Some of them went West, often in the hope of making good in new territories. 150 years ago this month one Irishman wrote back to New York, describing his life as a silver miner in the vast expanse of the Nevada territory. Silver was first discovered in Nevada at the Comstock Lode in 1858. In 1862 further deposits were discovered in the Reese River district, where ‘Rambler’, the Irish letter writer, penned the description below. He was based in Amador, a town established in 1863 after the discovery of silver there. It reached its peak in 1864, when ‘Rambler’ was present, but the silver was not as extensive as first thought. By 1869 the last resident had left, turning it into a ghost town (you can read more about it here). 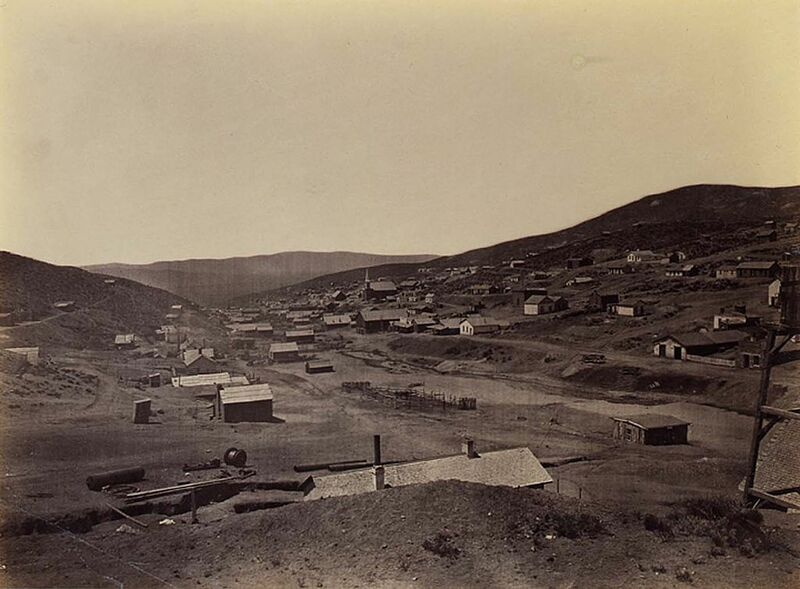 ‘Rambler’ describes St. Patrick’s Day in Austin, Nevada, a town also founded on the back of the silver rush, in 1862. Although thousands of people lived in the area in the 1860s, today just a few hundred can be found there (you can read more about Austin here). Among the fascinating details of Rambler’s account are the miners relations with Brigham Young and the members of his Latter Day Saint Movement in Utah Territory, who were one of the trading suppliers to the Nevada settlements. Gentlemen- Notwithstanding the far distance and craggy road between here and there, your good and faithful journal pursues its way, and nothing enters to us into this wild country that is received with such welcome as a number of the IRISH-AMERICAN. Doubtless you have a vast number of eager readers and New York and the Eastern States; but I’d venture to say that they don’t prize it as much as we far-off miners. As a matter of course you have a pretty good idea of what a sailor’s and a soldier’s life is; but very few understand what a miner’s life is, save those who have traveled through some of these mineral countries and experienced a little of the hardships a miner has to undergo in prospecting for both silver and gold. This country differs a great deal from California with regard to prospecting; for in the latter-named place a miner could take his pick, pan and shovel in the morning and have the produce of his day’s work in with him in the evening. But in prospecting the silver mines of this Territory, a man must have the back of a mule and the courage of a lion. He must know how to wash and mend his own clothes; to cook his own beans; to make his own bread; he must learn to sleep in the sage brush, with nothing between him and heaven but one pair of old blankets; he must learn to let snakes and all kinds of obnoxious reptiles crawl around him whilst asleep or awake; he must learn how to drink alcohol, and call it the best of cognac; he must learn to pack his blankets and grub; and he must learn not to growl if he thinks a storekeeper is cheating him, and after that he has to take his sledge, drill, pick, powder and fuse and go dig and blast in the face of the mountain, following a ledge of silver and gold, which he sees in his imagination, and follows for months in the bowels of the mountain. If he is lucky enough he may strike it at a distance of between two and three hundred feet. Not until then does the so-called “capitalist,” or rather the “land shark,” come along and take hold of the lion’s share, and the first thing the poor miner hears of is that there is a freeze-out game aboard; and the next thing he is made to understand is that his ledge has been sold for something; but as a matter of course, he cannot help it. He has not got any money; he lets matters slide, and, going into something in the shape of a bar-room, to sit and chat and smoke, drowns his trouble in a drink or puffs it off in smoke. But to return to the storekeepers. They are the most honest and agreeable creatures in the world. They never charge over two prices for anything, since they have to get everything from California. Flour they sell at $20 per hundred; by we must thank out stars that we have our good friend, Brigham Young, who sends his produce along and underrates our California merchants ten per cent in his flour; and whilst he underrates then fifty per cent in quality. In this our storekeepers make a mistake, but as the poor miner buys a sack of flour, and pays the highest price for it, it is not until he brings it home and makes a loaf of bread out of it that the mistake is found out. Brigham I have never seen; but folks say that he entertains the greatest welcome for his approaching neighbors, and as a mark of regard he also sends some of the nicest potatoes you ever saw, and only charges 20 cents per pound for them. They look just as if they were made for miners’ use, because he can take a round dozen of them in his jaw, and keep up his corner in telling yarns about his girl in good plain English. Brigham also sends us some very fine eggs, and charges only $1 per dozen. Your humble scribbler, having a hankering for eggs, a few days ago went and bought a dollar’s worth, and, after a close examination, found he had not only a dozen of eggs, but a dozen of live chickens in the bargain. I see by your good paper that St. Patrick’s Day is still appreciated with the old feelings. You must not think that, although we are in this country, far from friends, we let it pass unnoticed. No, sirs, we had a very pleasant celebration, for the first time in this part of the country. It’s too far gone to state all the proceedings, but I tell you that our firemen’s procession, headed by the Austin brass band, playing the old Irish airs, and our ball in the evening, made the hills around Austin ring, where nothing but the yells of wild beasts and Shoshone Indians had been heard twelve months before. New York Irish-American 9th July 1864. The Life of a Miner. I have been following your blog for more than a year – having discovered it while researching family history – and wanted to let you know how much I appreciate your work. – I am a trained historian but amateur genealogist – so I first want to thank you for your careful use of sources and documentation as well as your helpful instructions/outline of research tools available online. – The collection of individual voices that speak through your research have a collective impact and have led me to see the history of famine Ireland and its diaspora, its roots in British political and economic policies, and the larger, international context of American Civil War and post-Civil War US history in an entirely new way. I now have a very different context for the various lives in my family tree. – As you venture into the Western adventures of Irishmen you are also charting a different map of the Civil War years in the US, which usually clings to the East coast. I will continue to read your blog. I wish you luck in the US archives – good hunting – and look forward to more new research. Many thanks for your kind comment, it means a great deal that you have found the site so useful. The reason I keep it going is in the hope of reaching a wider audience with their experiences and stories, so it is very gratifying that you enjoy it so much. I hope you continue to enjoy the site! This is great. I don’t think I’ve ever seen so much sarcasm in a period letter before. It is dripping with it alright- it obviously goes way back as commonplace among the Irish! Thanks for the comment- that is a great line I am going to have to remember that!